Many artists live in precarious conditions, and few can make a living off their art. Initiatives like fair music providers and fair-trade certificates for music labels show how a more equitable value chain could be created. While there are more YouTube millionaires and casting show starlets today than ever before, the majority of artists in Germany live an uncertain life. Many protest that the bureaucratic hurdles, pressure to market themselves, and competition are growing all the time. This is particularly noticeable in Berlin, home to an unusually high percentage of artists, even by international standards. For years, cheap studio rents lured artists to the city in droves, but costs are now rising. Although living space in Berlin is still cheaper than in London or Paris, the average rent has almost doubled over the last ten years from 5.20 euros to 9.50 euros per square metre. Berlin ranks number one in Germany, leading the country in skyrocketing rents, though cities like Hamburg and Frankfurt have also recorded hikes of an impressive 50 percent. In 2018, the Berlin Institute for Strategy Development published a study on working conditions in fine arts: “The Situation of Berlin’s Artists and the Gender Gap”. It found that 80 percent of those working in the fine arts sector in Berlin actually lose money on their art, and only one in ten reported being able to live off their art all year round. On average, women earn about one-third less than men. Additional, the study predicts that around 90 percent of the over 1,700 respondents will ultimately slip into poverty in old age with the average expected pension at just 357 euros a month. The stereotype of the starving artist is not just based in reality, but also appears to be the rule rather than the exception. Perhaps as a result, the movement to advocate for fair trade in art is growing – for instance in the music business. Many players are involved in the music download value chain, including labels, distributors, platforms, copyright societies, agents and managers. In the confusing market of download and streaming providers, the size of the slice of the pie going to the artist varies widely. iTunes, for example, pays out about two-thirds of the revenue the company earns from a sale to a song’s author, but in return charges a hefty annual fee that smaller groups can find especially difficult to pay. The “Information is Beautiful” infographic portal estimates that a solo artist would have to register 1,826 song downloads per month on iTunes just to earn the American minimum wage. Among the major providers, the Bandcamp online platform passes the largest share of the proceeds, 85 percent, on to musicians. Music platforms that specialize in fair conditions provide an alternative. Such as the Swiss start-up igroove, which offers songs by more than 3,000 performers for download under fair conditions. A full 92 percent of revenue goes directly to the artists, and music lovers can also support their favourite artists by paying more if they wish. The cooperative Resonate is another option. Instead of a monthly subscription model, it developed a unique stream-to-own system. Listeners pay a small amount each time they play a song. After nine plays, the song is completely paid for and can be downloaded from the platform. At Resonate, all the members – artists, labels and music lovers – jointly determine the rules and share the profits amongst themselves. 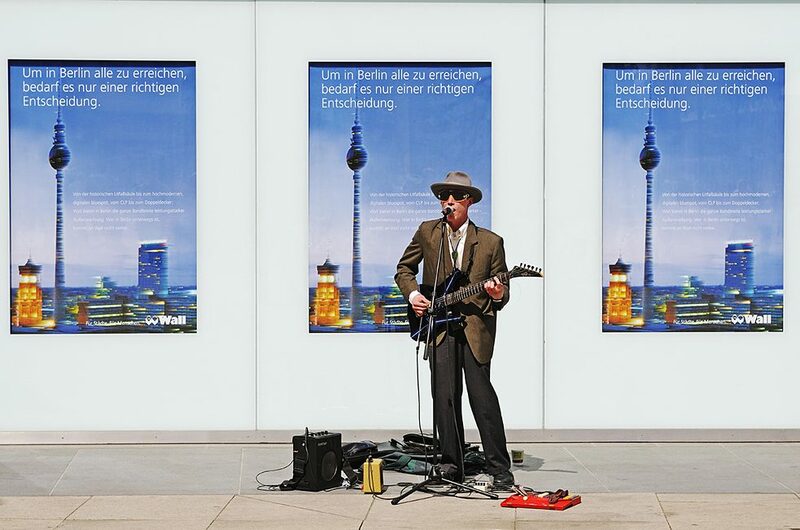 Busker in Berlin. | Photo: © picture alliance/imageBROKER Ultimately, the power lies with consumers. But they often lack the information they need to make an ethical choice. The Canadian Fair Trade Music International (FTMI) NGO has therefore developed a fair-trade certificate for music. Similar to conventional fair-trade products like food, a logo guarantees that the respective music outlet shares the profits fairly with the artists. At least 80 percent of revenue must be paid for the right to use music in order to receive the seal. FTMI is now supported by half a million musicians worldwide, but only a single music label has received the certificate. Most music publishers find the certification process too complex, says the NGO. Among other things, it is hard to convince the major streaming services and music labels to disclose their financials as the accreditation process requires. The Art but Fair association is trying out a different approach in Germany, Austria and Switzerland, and focuses first and foremost on awareness raising. Through actions such as the “Künstler-Klagemauer” (Artists’ Wailing Wall), a Facebook page where artists can post about their experiences with unfair working conditions, or the “Goldene Stechpalme” (Golden Holly) prize awarded for the saddest and most outrageous incidents in music and the performing arts, the association wants to draw the attention of politics and society to grievances. The aim of the association is to develop a certificate for cultural institutions that offer fair working conditions in hopes that state support for culture will be linked to this quality seal in future. Until then, the only option for artists is the voluntary contract the association has drafted, which stipulates that signatories regularly submit progress reports to the association. In return, their names are published on the website. Contract partners agree to accept only employment relationships with an appropriate salary and to insist on compliance with labour laws. The contract is not just intended for artists, but also for employers and cultural politicians. Individual managers, directors and one politician have already signed on.